In a world that is rapidly and ever-changing, all the connections in our life demand more of us. Whether loving or stressful, or both, balancing these relationships is tough. Fortunately, mindfulness practices show you how to make lasting relationships that are more manageable, meaningful, compassionate, and collaborative. 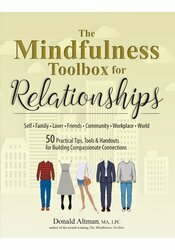 Award-winning mindfulness author and expert Donald Altman delivers practical mindfulness tools that relieve stress and enhance daily living. Easy-to-use, detailed handouts offer freedom from old, stuck habits while providing life-affirming strategies for healthy, fulfilling, sustainable connections of all kinds. Donald has reached out to the community by serving as vice president of The Center for Mindful Eating and as an adjunct professor in Portland State University’s Interpersonal Neurology Certificate Program. He travels internationally, spreading seeds of mindfulness as a health and business consultant, keynote speaker, and mindfulness workshop leader. He lives in Portland, OR, where he enjoys mindfully riding his motorcycle through Oregon’s natural beauty. For more, visit www.mindfulpractices.com.